When you had two great offers for a card that ran separately over a certain time and both worked well what should you do? Combine them! Why not? 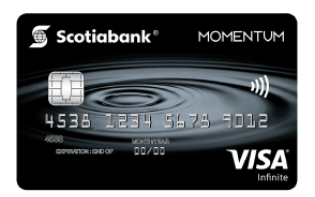 That's exactly what Scotia has done with its Momentum Visa Infinite Card to help the card compete in the hot cash back market right now! They took the start of the year offer of 5% cash back on all purchases for the first three months of having the card and have now combined it with the Spring/Summer offer of having a first year annual fee waiver. • Earn 5% cash back on everyday purchases for the first 3 months. Plus, annual fee waived for the first year.